Every mom needs to find a moment or two to herself. Over the years have come to realize how important it really is to take time for myself and indulge in some pampering every once in a while. And in the crazy hectic world I live in, taking an hour or two every few weeks just for me helps keep me sane. I am a better mother, wife, friend because of it. So when I first heard of Karen of Firefly Wellness through Joann’s Sign4Baby facebook page I knew I had to check her services out. Karen not only provides massage therapy but is a licensed esthetician as well. She has been working as a massage therapist and esthetician in San Diego for 11 years. And her office is conveniently located in North Park, right up the freeway from us! She started out in the corporate world as a computer programmer. She would hold training seminars and programed for a large software company. After a while she began to realize that she didn’t love what she was doing and decided to “jump ship”. She went to school to become a licensed massage therapist and esthetician and started working in a spa. After a few years the spa closed shop and Karen made the jump from working in a spa to working in her own private office. She continued to work at other locations offering chair massages at events and going to clients homes for in-home services. But when she gave birth to her son 4 1/2 years ago she decided to move her business all to her private office and now provides services in a beautiful and tranquil cottage in North Park. When you walk into her courtyard you first find a cozy seating area usually occupied by a friendly and cuddly black cat. Then you are taken into the room and are immediately put at ease by the calm and tranquil energies that surround the area. Karen takes her time in talking with you about your main concerns, what you want to focus on and what she can do to help you out. If you are receiving a facial or microdermabrasion treatment she will ask about your skin and what your goals are. She can customize the treatment she uses to your needs. And her massage therapy techniques aren’t any different, every massage is customized to the need of the client. Karen’s life experiences and education have helped her become an amazing massage therapist and esthetician. I’ve experienced both her prenatal massage and mini facial. Both were amazing experiences. With my first pregnancy a good friend told me how important massage was for my pregnant body. So I made sure to indulge twice during my second trimester and once during my third. 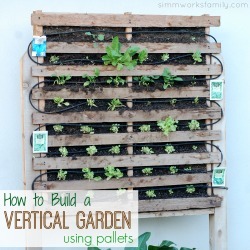 When I became pregnant with Molly I knew I wanted to do the same (if not more often). So I decided to try Firefly. And I was so glad that I did. I left her office relaxed and refreshed. My sore back and aching shoulders felt much better and it wasn’t as difficult to pick up my son. Caring for a toddler really takes a toll on a pregnant woman’s body! And the mini facial I received was the perfect end to my week. I went with a more relaxing facial then an extraction-based facial and when I left I definitely felt relaxed. I almost wish I upgraded to a full hour facial like Laura did. I was cleansed, massaged and masked. My skin and lips were glowing afterwards. And not only does my skin feel amazing, I was given great suggestions for products to use on my face to continue the glow. And I’ve already booked a pumpkin peel with Firefly Wellness for later on this month. Microdermabrasion improves skin texture while diminishing fine lines, hyperpigmentation, uneven skin tone and the appearance of scarring, resulting in smoother, lighter, and brighter skin. There is minimal discomfort and no recovery time is required. Each massage is customized for the client based on their current needs. Firefly Wellness also offers skin rejuvination treatments as well as waxing. Basically Firefly Wellness is a one stop shop for all of your pampering needs! And packages are offered with discounted pricing. There are two different payment options for packages; either pay as you go or pay up front for a $10 discount. Gift certificates are also available for purchase. Firefly Wellness is currently offering a BOGO 1/2 off special on a Pumpkin Peel. 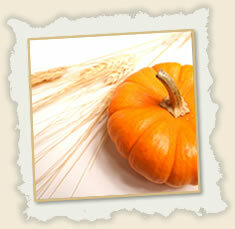 Come in before October 15 for a Pumpkin Peel and schedule another one before the end of the year to get the BOGO deal. The regular price for a Pumpkin Peel is $80, so with this deal you can get two for $120. (Must be paid in full at first appointment.) There is a limited number of openings for this deal, so call now to reserve your time! There are also options to add the Pumpkin Peel on to a full facial, and it can be a great compliment to microdermabrasion as well. To reserve your time and schedule your Pumpkin Peels, call 619.249.4323, or email Karen@FireflySanDiego.com. Firefly Wellness has been kind enough to offer one lucky reader a 30 minute massage, facial or microdermabrasion treatment – winner’s choice! Want to know how to win? It’s simple. Just follow the instructions below and enter your responses in the Rafflecopter prompts. San Diego is one of the best places to own a pooch. Not only are there a multitude of parks and play areas for dogs to go and socialize but there are also a lot of eateries you can take your dog to as well. There are even dog bakeries! San Diego dogs are some of the luckiest dogs in the US. We’re a family who loves the ocean and the beach. So when we adopted our coonhound, Scout, 7+ years ago we knew we had to scope out the dog-friendly beaches in San Diego right away. There were a few beach options we knew about right away but then as we started talking to fellow dog owners and we found that there were even more around to check out. I’ve even mentioned a few before. And now that Scout is without his buddy, Jetta, we have been taking advantage of having such wonderful beaches in our back yard. Below is a list of the dog beaches in San Diego. Do you have a favorite? Located in the picture perfect city of Coronado, the dog beach in Coronado is at the most northern end of the beach next to the Naval Air Station. Wide and sandy, with the Pacific surf and the Hotel del Coronado in the background, we’ve found Coronado’s dog beach to be the friendliest in town. located on Ocean Blvd. near Sunset Park. Most of this large sandy island in Mission Bay is designated leash-free for dogs. Lots of sandy dunes to romp in, and the calm bay waters lets the more adventurous dogs take a quick dip. There’s a semi-fenced off dog area as well to let the dogs romp safely without running into the one-way road. We’ve found Fiesta Island the best dog beach to exercise with our dogs at. (off-leash) – located in Mission Bay Park, dogs are allowed in all areas except for the Youth Campground and Least Tern nesting sites (seasonal). Daily 6:00 am – 10:00 pm. Located in northern Ocean Beach, Dog Beach is the original dog beach and one of the most popular places to take your dog. This beach area is located at the west end of the San Diego River Floodway, also known as the Ocean Beach Flood Control Channel. With a large amount of sand to run and frolic in, this is a large area for dogs to have fun at. This is also the best beach for your pooch to catch waves AND wade around in the calm(er) flood channel. And as always, beware of left-over accidents (most owners are conscientious about cleaning up after their dogs). (24 hr. off-leash) – located at the west end of Voltaire St.
A nice, low key spit of sand to let your dog roam in lovely Del Mar, but with limitations: the off-leash designated is seasonal only, so bring your dog without its leash only from September to June. Parking is also at a premium, and parking tickets flow freely in Del Mar (believe me… I’ve had personal experience with this). (October thru May off-leash) – located at Via de la Valle and Highway 101 at the rivermouth. Off-leash area is north of 29th St. While I’ve never been to this beach I’ve heard that it’s good for dogs who like strong surf. And it’s a great option for those a little farther north of the San Diego beaches. (24 hr. off-leash) – located on Ocean Blvd. near Sunset Park at the northern end of the beach next to the U.S. Naval Station entrance. Dogs must be leashed until you reach the beach. Foot shower and free dog litter bags at the entrance to the run. Now I know I need to start posting about my experience at BlogHer’11 before I start forgetting very important details but I needed some time to decompress before jumping in. And I really need to clean the house… 3-4 days away from the home and it looks like a disaster area! Now that I’ve decompressed I can push the house cleaning to the side and jump in to share my experience(s) at BlogHer. 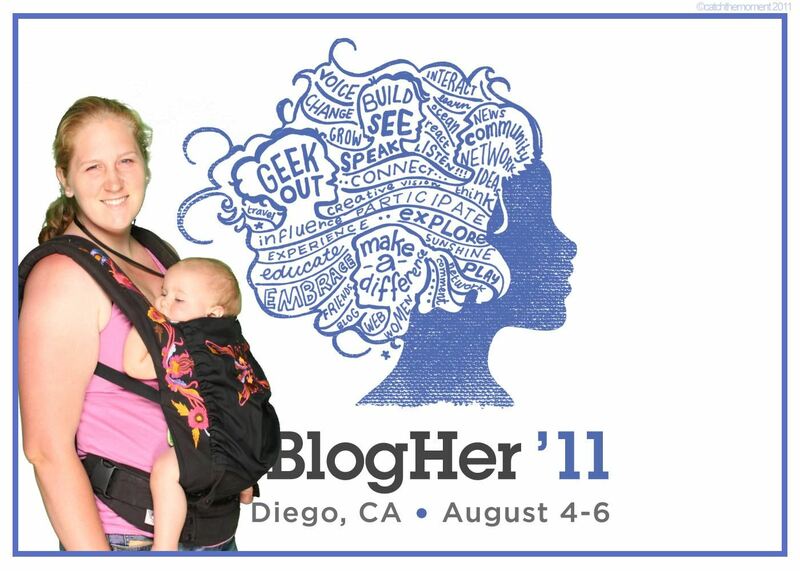 I thought the best way to do this would be to write about different aspects of BlogHer. I will start by talking about my experience taking Miss M with me to attend the conference on Friday and Saturday. Before I even signed up to go to BlogHer back in February I knew I would more than likely be taking my little girl with me. So I kept my eyes and ears open for any and all suggestions for taking nurslings. Luckily a lot of people on twitter, including the ladies at BlogHer themselves, eased my mind and made it very simple to figure out how to work things out. Not only did I have the support of 3000+ women (including many, many moms) but I also had the support of the conference itself. BlogHer set up a special Lactation Room that could double as a changing station and storage room. I was able to drop off my diaper bag each day so I didn’t have to lug it around with me and I was provided with nursing pads, wipes, and samples of other Lasinoh products. There was even food for M. The awesome ladies at the Ella’s Kitchen booth in the Expo let me grab a few puree pouches for her to try and guess what? She loved them! I’ll definitely be buying those for Hawaii at the end of the month. 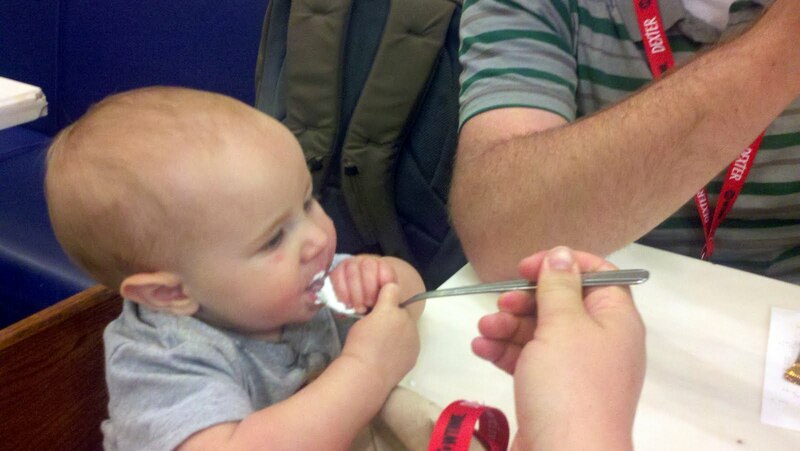 During meal-time there was always a smiling face and pair of hands for my daughter to go to while I ate. None of this scarfing food down in 30 seconds or less before having to stop a hand from grabbing food out of my mouth. Friends and strangers alike were more than happy to have Molly sit in their laps. And I let them! I even met an amazing woman at the Quaker Breakfast with Bob Harper who not only held M for me but also gave her an adorable knit bunny toy! How awesome is that? I have to get a picture of M and her new toy. And while I was oogling Bob while asking him a question he surprised me by complimenting me on how beautiful M is. Swoon! Maybe next time he’ll hold her while I eat. Healthy food, of course. She was also my ticket to getting a picture with him. He couldn’t pass up an adorable, sleeping baby. Each session I walked into was like a breath of fresh air. All of the women around me would smile at M and myself and those who I sat with would reassure me that they were there to help me out if I needed it. I brought a small Aden & Anais blanket with me and used it to let M play on the floor when she wasn’t sleeping or nursing. She even started to fuss during (in my opinion) the most informative and inspiring session, How to Put the Professional in Professional Blogging, and Jessica Rosenburg of ItsJessicasLife.com and Tiny Prints turned to me, smiled and mouthed, “It’s ok!” as I rocked and shushed M in hopes that she’d go to sleep. Luckily shortly after she did pass out and I got to enjoy one of the best sessions of the weekend. 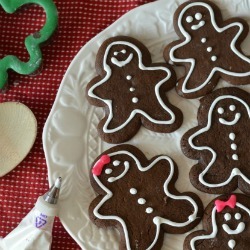 Check out a great recap here on Vampy Varnish’s blog. I was lucky enough to meet up with Jessica of And Then There Were 4 and scored some awesome Smart Mom Teething Bling including a necklace and bangle bracelet. This kept M entertained during sessions and while I was walking around from location to location. I am pretty sure there are many pictures out there of M gnawing on mine or Jessica’s necklaces. Another lifesaver was my Ergo carrier. As I’ve posted before… I love my Ergo. M never once complained. I guess I wouldn’t either if I had the option to be carried around. All throughout the conference women commented on how pretty the design was. They had never seen embroidery on the Ergo before. It definitely made the carrier more appealing to those I talked to. I hope to see you (and your baby) there! There’s no way I’m missing another BlogHer now that I know what all the hype is about. I’ll be the one offering to hold your little munchkin next time. Maybe your little one will learn to wave like mine did. See a video of her doing it (at home) below. And stay tuned for more fun posts about all of the great memories I’ve made over the past few days (like the Flash Mob I was in and an awesomely amazing limo ride!!) and to thank the generous sponsors who hosted the amazing parties I hung out at with my friends (old and new). I’ll also be hosting a few giveaways that I’m very excited about. We had another wonderful year at Comic Con International. We went in with a plan and got to see everything we wanted to see. Now that’s success! We started off the morning by finding a great parking garage just a block from the convention center (only $12 for the day vs. the $20 a day signs everywhere else). Then we headed out to wait in line to get our Sunday passes. We were greatly surprised by the number of people already waiting in line and weren’t expecting how long it was already. We passed my cousin and her family on the way to the end of the line but wanted to be courteous of the other people who got there earlier than us and we didn’t ask to sit in line with them. But when we got to the end of the line we almost went back to ask. Though the view from the end of the line wasn’t that bad 🙂 That’s San Diego for you! 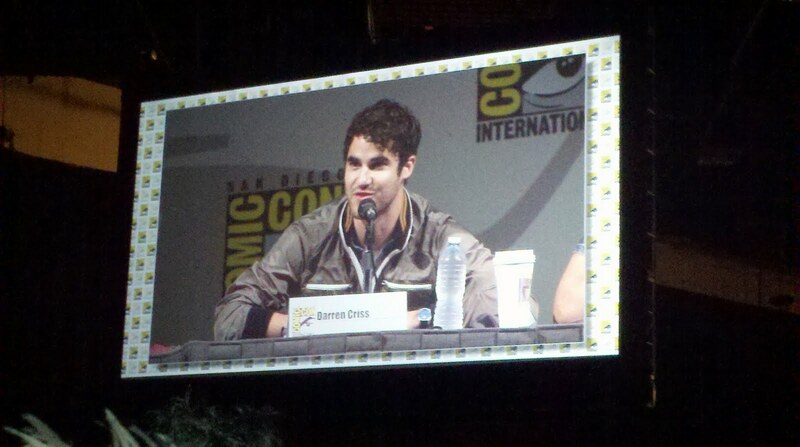 Once we got our badges it was off to Hall H to wait in line for the Glee panel. 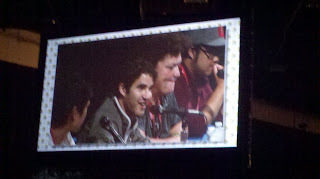 My friend, Amanda, was already in line so we were able to sit with her in hopes of getting in to see the panel. Once the line started moving and we saw how many people there really were we were almost certain we wouldn’t get it. Especially when it got down to us being two queues from being let in to the hall and there being a break in the time it was taking for the line attendants to come get another queue. But we were super lucky I guess. We got in! It was standing room only by the time we were let in but that was fine with us. E hung out with Daddy and enjoyed seeing all of the people while M slept for the first half. 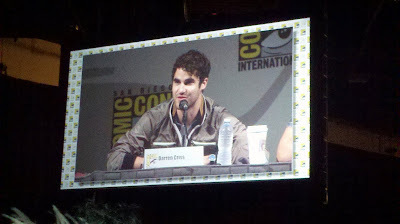 We got to listen to the panelists answer questions about the upcoming season and the changes they have in store for the cast of Glee (Curt’s boyfriend is sticking around!). Pretty exciting stuff! After the Glee panel we headed off to the main exhibit floor to see what was going on at the different booths. We got stuck at one booth in particular. Lego may or may not have just dumped a whole ton of yellow bricks in the middle of the floor for the kids to play with. And that’s all E wanted to do the whole time we were there. So since we’re super cool parents and were basically there for him anyway (J went alone on Saturday) we sat down on the floor and built together. It was quite fun! 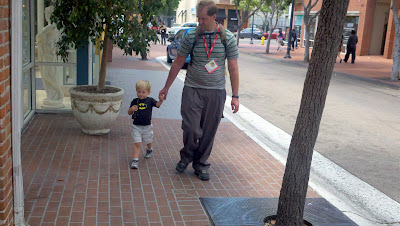 After we were done with exploring we decided to go out of the convention center in search for lunch. E was already asking for food so in order to avoid any meltdowns we stopped at the nearest place we found. . As soon as we crossed the street we saw two food trucks and made a b line for them. Luckily there were choices for all of our different tastes at both. E had a yummy hot dog from Ms. Patty Melt. Sadly they were all out of ketchup but luckily E doesn’t eat any on his. They only take cash so J and I headed over to Super Q. OMG! Seriously the best BBQ pork sandwich I’ve had in a long time! I had the Super Q Pork Melt. 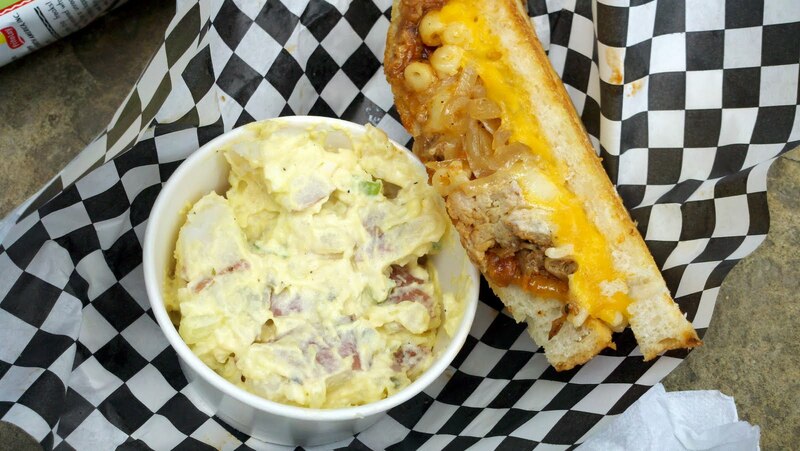 It came with bbq pork, mac-n-cheese, sauteed onions and lots and lots of cheese on sourdough. 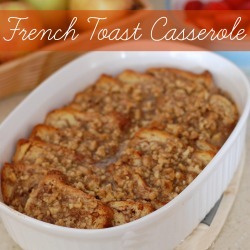 I can still taste it and am already craving more! The sandwich was huge. Definitely more than enough for two. And it also came with a side of potato salad that was equally delicious (but you could get cole slaw or chips instead). Joseph decided on a duo of sliders. He got the beef and pork and seemed to enjoy them. He didn’t leave a crumb when he was done. Once we got our food we headed across the street to a park to eat. 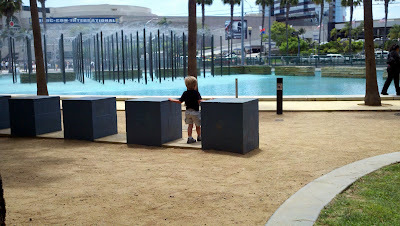 E loved the location because he got to chase pigeons and stare at the water. We may have had to take him away from the water a few times because he looked like he was going to jump in! 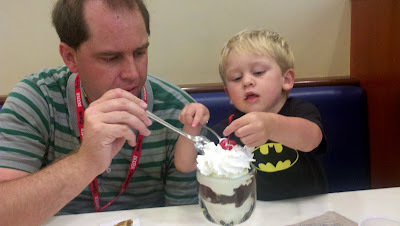 Once we were done we bribed E with the promise of going for ice cream at Ghiradelli’s if he left with us. And although the allure of running away and finding a new family was strong he decided to stick with us. The walk to Ghiradelli’s was comical to say the least. Being the pushover, er, great Dad that J is, E got a vanilla cream soda with his hot dog. The soda was in a brown bottle that definitely didn’t look like a soda bottle. 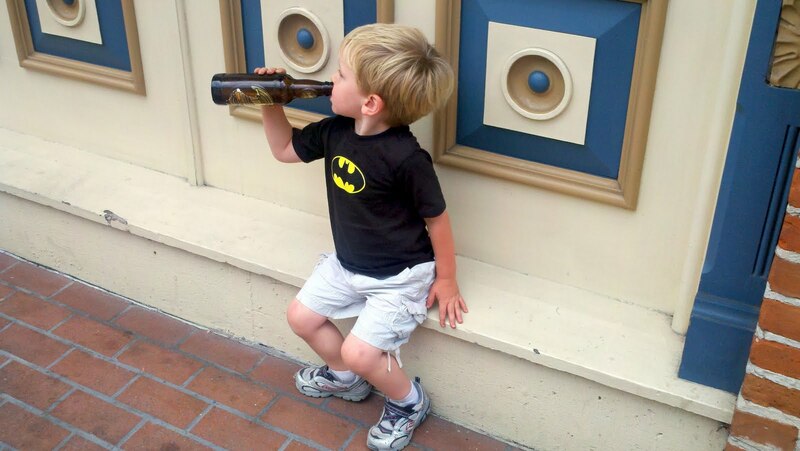 So every block or two there’d be a comment from a passerby (or someone sitting at the outside patio of a bar) that we were starting him young. What can I say! When he’s walking down the street trying to drink he doesn’t quite walk in a straight line. He even stopped every once in a while to sit on the side of the sidewalk whenever a ledge made itself available. Once we got to Ghiradelli’s he was more interested in the cherry on top than the ice cream itself. That may have had something to do with the fact that he ate both mine and J’s sample Ghiradelli square before we got our ice cream. M enjoyed her fair share of whipped cream but didn’t quite care for the ice cream. I’m not sure if she really is my daughter… 😉 So after only eating 1/2 of our sundae (we split it) we packed it up and headed back to the car. Of course as soon as we left the table to go outside E announced that he would have preferred a cone. Oh well! We tried. As soon as we got into the car and out of the parking garage he was fast asleep in the back seat (M had fallen asleep on the walk over to the car). He slept for a good 3 hours! There’s nothing like walking all around Downtown San Diego to get your toddler thoroughly exhausted. Every year since E was born we’ve made our way over to the SD County Fair for their discounted Tuesday. The past two years it was $2 Tuesday. This year it was $3 Tuesday. Pair that with $2 Taste of the Fair Tuesday and you get one discounted day at the fair! Definitely worth every penny. And we did it for under $30. We sampled some yummy fair food including meatball sliders, freshly made mini donuts, corn dogs, cinnamon rolls & ice cream. We saved a bit of room for when we take Daddy. But all in all we got a taste of everything we wanted that day. Each “taste” cost us $2. Once we got some food in our belly we were ready for the animals. The animals are one of E’s FAVORITE parts of the fair. When we come again we’ll see them again. Maybe even twice through. Ethan was very curious about the cows and had many questions. One of them being why they were laying down and if he could pet them. He asked if he could pet every single animal he saw. (The blanket is there to cover their legs from the sun, not to keep them warm ;)). Goats were super fun. They made lots of noise and kept both kids happy for a while. We just parked in front of a few and just watched what they did. Then we came up to the birds. 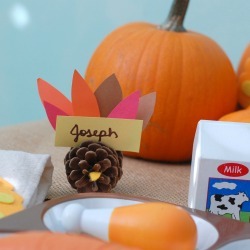 Ducks, chickens and turkeys oh my! Ethan loved this large turkey. He kept talking to it and putting it’s bedding back in it’s cage for him. 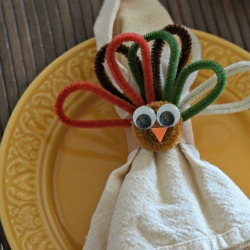 He even mimicked him when he gobbled. In the same area as the birds they had a petting zoo and other animals in larger pens. We caught a glimpse of this little oinker tinking. E wanted to know why it wasn’t using the potty. E kept reaching his hands in the fence and calling the goats (and cows, chickens & pigs) over to be pet. Next time we’ll have Daddy with us so we can do the petting zoo. I hope to get some good pictures then! All in all it was a great day with the kids. Something I hope they remember fondly as they grow up (as I plan on continuing the tradition yearly). I remember how much fun I had at the fair when I was younger so I hope they do too! On Saturday this weekend we headed over to Office Depot to pick up a scanner. The Office Depot we first went to was out of stock so we asked if they’d check stock at the Downtown location. We were in luck. They had one! Now you’re probably wondering why the heck I’m talking about a scanner when the title of this post clearly states that it should be about Seaport Village. You’re right. But I’m getting to WHY we went to Seaport Village. My dear two year old decided that we were going downtown not to pick up a scanner. No, he thought we were going there to see boats. Sadly for him he was wrong. And we really were just picking up a scanner. It was late, his sister was getting very tired and Mommy and Daddy just wanted to sit down and relax. So I made a promise. If he was a good boy that night we’d go see boats the next day. And low and behold he was a good boy all the way through bedtime. So the next morning we waited for Molly to take her first nap and then headed out to see boats. We didn’t quite know where we were going but I knew I wanted to end up by the Star of India or the Midway. So we decided on parking at Seaport Village and taking it from there. As soon as we walked in through the little shops E found the water. In a small pond form. With ducks. He was ecstatic! And as an added bonus there were baby ducklings too. When we turned to another area of the pond there was another duck mama and her set of ducklings as well! Two sets of mamas and ducklings. that has to be a good sign of a great day. E just kept asking if he could “pet them” and we told him if he could reach the mama duck then he could definitely try. It didn’t happen. Mama was watching over her ducklings swimming to the side of the small stream through a strong current. Then we headed towards the water. The real water. And E loved what he saw. Sail boats and speed boats were going by and he got to watch them. For as long as he wanted to. We gave him full reign for our outing and let him choose when he wanted to stay and when he wanted to move onto the next spot. He quickly found more water. And this time at a spot where he could actually touch it. He asked me to roll up his sleeves and got his little hands in there so quickly. He loved pointing out all of the monies to me. But he listened and only used his fingers to play with the water. His wrists were hardly wet by the time he decided to move on. E asked Daddy to help him look farther out and just gazed around for a bit before he decided he wanted to see some big boats. But then he saw the telescope (is that what these are? I’m just assuming). And quickly wanted to be lifted up again to check it out. Sadly we had no change on us. So he just pretended. And told us he was a pirate. What an imagination already! Then he saw a small pier and asked Daddy to take him out to see if he could find any fish or birds out in the water. As we got to the edge of Seaport Village we continued along the harbor and started to see the larger boats. In the background of these boats you see the USS Midway. This ship is now actually a museum. We plan on making it a day trip in the near future. I really think E will like it. He already started pointing out the airplanes and helicopters on the deck before we even got close to the ship. This is when E started to get tired. We were pushing naptime up in hopes that we could get some fun in before getting back home to do housework and yardwork. He enjoyed having Daddy carry him. E munched on french fries and had a few of my black beans. He even had a taste of each of our sandwiches. M enjoyed the crust of my sandwich. She really got mad when we were leaving and she couldn’t have any more bread. That little one really likes food she can’t have already! By the time we got back to Seaport Village we had worked up a little more room in our stomach. And E had a bit more energy so we grabbed our Entertainment book and tore out a coupon for Ben & Jerry’s. We enjoyed waffle cones. E and I shared. We both didn’t need a whole one. M even got some in the end. She finished off the waffle cone! If you are by a Ben & Jerry’s and they have the coconut seven layer bar ice cream flavor available try it! It was amazing! And don’t try to take the end of a waffle cone away from M. She gets pretty upset when food is taken from her. Even if it is a choking hazard. All in all we had a fabulous day. It was low key, inexpensive (about $30 for the whole day including parking) and we got to enjoy the beautiful weather and scenery that makes our city a tourist destination. 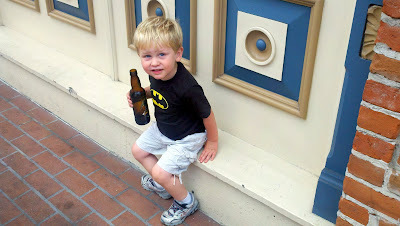 I’m hoping to do a lot more “tourist trips” with the family this summer. Being a tourist in your own city is pretty darn fun! 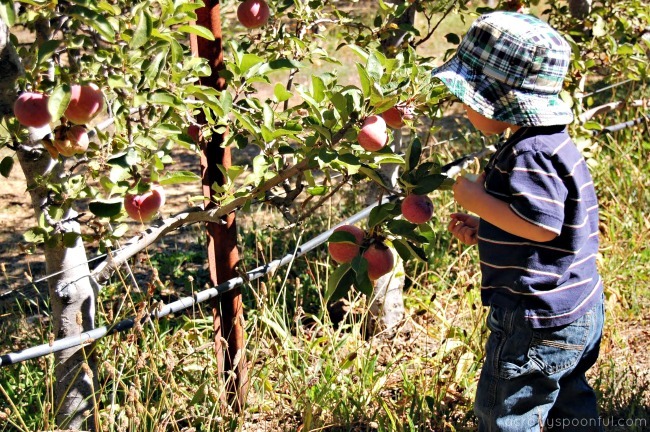 Apple picking in Julian is the perfect family tradition to share with your kids! Make a weekend of it and get a room at one of the B&Bs up in Julian or simply make a day trip out of it. I have been wanting to go apple picking in Julian for quite a while. I’ve always heard great things about it and when the end of summer hit I knew I needed to plan a weekend day of apple picking with the family. We were planning on going on Saturday but work got in the way and Joseph had to go in and work on a large project until 4 pm. So we pushed our apple picking adventure to Sunday after church. We went to 8:30 mass at Joseph’s old high school and were surprised to find out that they were hosting an event for the parents/kids of the school shortly after mass so the priest skipped the homily to get us out faster. Now I wouldn’t say this in front of the little one but SCORE! This means we’d be on our way to Julian sooner. So as soon as mass was over we headed on our way. Julian is about 1 hour and 15 minutes away from us so it’s not too far but just far enough to make an 18-month-old a little cranky. And of course, my son didn’t want to nap on the way up. He might miss a cow or a horse out the window (which he was in search of since his first spotting). 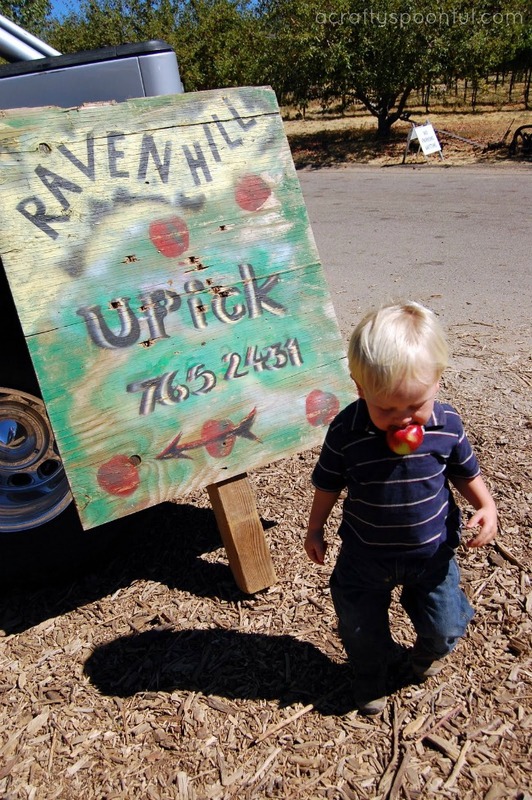 When we got to Raven Hill Orchard he was ready to go! As soon as he realized that we were picking his favorite fruit, he was completely on board. 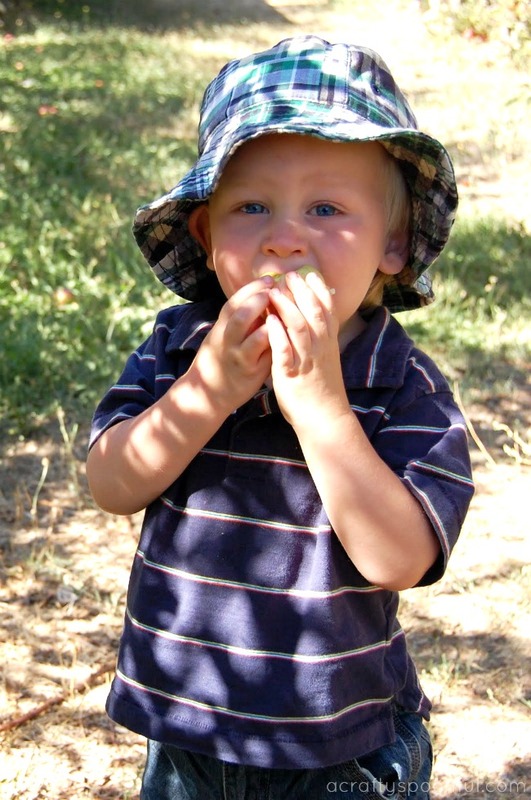 He consumed about three small apples in the time we were picking, and one on the way to Julian. I think his favorite thing to do was “wash” the apples on Daddy’s pants and then take a huge bite to see what each apple tasted like. He tried Jonathan apples, Gala apples, and Empire apples. 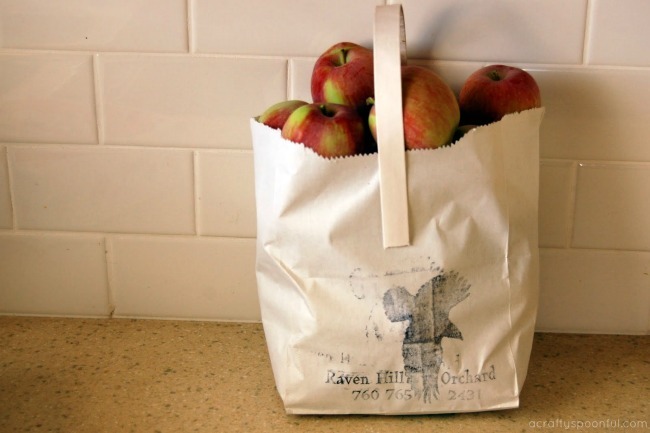 At Raven Hill, you pay $10 a bag and happily pick until your bag is completely full. We also ate along the way so really we got a snack and a bag of apples for $10. Totally worth the money. Afterward, we headed to Julian for an apple pie (yes, I’m sure I’ll make one with the apples we picked but nothing beats a Mom’s apple pie!). And then made our way to Dudley’s Bakery for sandwiches and more goodies. Joseph was hoping for some good sugar cookies but was disappointed to find a very small selection of cookies in their bakery. Mostly pastries and bread were sold there. BUT the sandwiches we got were MASSIVE and delicious so they definitely made up for the lack of cookie selection. And the little one was happy because he got chips, a grilled cheese sandwich, pickles AND a piece of Daddy’s chocolate chip cookie. By the time we got in the car he was passed out. Such a great family day 🙂 I hope to make this a tradition… our next fall family day will be to pick out pumpkins and squash at Bates Nut Farm in October! Have you been apple picking in Julian?